So, here in this blog, let’s explore it all about Mean stack, its advantages, and a lot of other aspects related to it. This basically is open-source software. In MEAN stack, the M stands for MongoDB, E for Express, A for AngularJS, and ultimately N stands for Node.js. To begin with, we will discuss all the terms here. When combined, these technologies excel at catering to complex demands and projects of the clients and hence they are nothing less than a blessing for web developers. MongoDB: This open-source NoSQL database uses a document-oriented data model, thus here it relies on architecture that comprises of collections & documents, and not tables & rows (as it is in the relational databases). Owing MongoDB architecture, the database is highly scalable and even handles a large amount of data. How is it beneficial to learn MEAN stack? Next, let’s explore more about the MEAN Stack technologies in terms of their growth all over the years. Node.JS & Express.JS: As web server and web development framework, MEAN stack web development has already been adopted by the big firms, like SAP, LinkedIn, and Microsoft. Other of its competitors in the arena of web development frameworks are Django, Laravel, and Rails. Now after framework, let’s explore databases. MongoDB: MEAN Stack uses a database, and apart from this, it is also Meteor.JS’ default database for its project. Its competitors are Neo4j, Couchbase, & Cassandra. Angular.JS: In the MEAN Stack, the ‘A’ stands for Angular.JS, while its competitors are Ember.JS, React.JS, & Backbone.js. After request is made by ExpressJS, MongoDB retrieve all of the data and returns response to the ExpressJS. Same way, ExpressJS returns response to Node.js, which then returns that to Angular.JS. How each component contributes to MEAN? Express.JS: This strengthens the back-end of MEAN stack. It brilliantly manages interactions between database & front-end as well ensures that data smoothly transferred to end-user. Its approach is that is minimalist and it has potential to efficiently handle all processes. Being mini malistic doesn’t make it featureless, however. Besides, Express.JS removes the chances to overwrite the variables. This way, one is unable to inadvertently redefine variable that was created earlier. Needless to say, it saves a lot of money as well as your time, this way. Node.JS: In the MEAN stack, Node.js is its backbone. Express.JS is specifically developed so it works on the top of Node.JS. Even Angular.JS seamlessly connects to the Node.JS and this way it facilitates fast data serving. With its in-built web server, it gets easier to deploy MongoDB database to cloud. Its scalability is its USP as well as it is able to support millions of simultaneous connections. Node.JS is greatly compatible to work with the low-resource requests instead of resource-intensive resources. By now you have learned the usage and architecture of MEAN Stack, and now it is time to know about its benefits. Best choice due to scalability: All the four components of MEAN stack are open-source, free and highly scalable. They even contain an array of additional libraries & reusable modules. This plays a significant role to accelerate development speed and saves a huge amount of time as well. The advantage of JSON: MEAN Stack developers can benefit tremendously with JSON. When developers choose AngularJS or MongoDB, it allows for seamless distribution of data between layers. Here one doesn’t have to write codes time and again. Also, developers can have access to PHP. Besides, the data can be important with help of codes from the MSQL server and even process it. Another advantage of JSON is, MEAN use similar formats each time and when reformatting, it saves a lot of time. What’s more pleasing is this fact that it supports external APIs, hence you can choose to work with them when required. Flexible & Highly-efficient: This JS framework offers great flexibility and efficiency and it can well handle the projects of all the sizes and firms. Often, web development is complex or client requirements are for single page apps or complex apps. But with the help of a skilled & experienced set of developers who have great coordination, then it gets a lot easier to work on different projects. Even sharing data and other info is simple here, as one just needs to add a field and follow further procedure. Exceptional performance: Called the backbone of MEAN stack, Node.JS is prominent for its amazing performance. It is better than numerous other back-end programming languages, like Python, Ruby, and PHP. Rapid MVP development: A lot of additional libraries, frameworks, & reusable modules available within stack contributes to increased development speed. With ready-made solutions, one just doesn’t save time but even makes the development less strenuous. This is the reason startups highly prefer MEAN stack, which also offers a solid foundation to build scalable software products. Lesser Development Cost: Yes, this is one significant benefit that businesses get from MEAN stack i.e. reduced expenses. Owing to the extensive codesharing & re-usage within the stack, there is lower development time and this results in lower development cost. 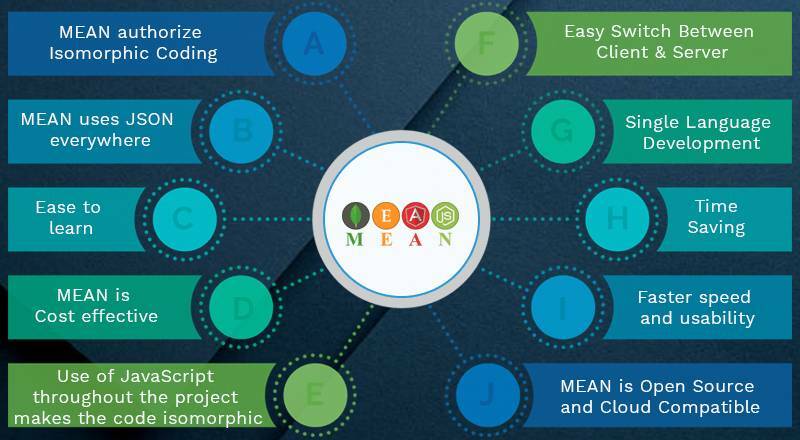 Also, MEAN and its rich ecosystem are entirely open-source and free for usage. Conclusion: Today, most numbers of brands are using MEAN stack for enterprise application development and also real-time app development. Owing to the many benefits of MEAN stack for developers, the development firms and the business owners, they all prefer to choose it over its competitors.